Just download this and play it loud and proud...No shame or guilt, just surrender to its power. The B side is "good" too! 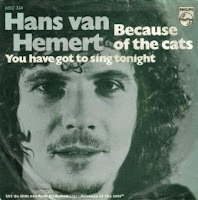 Hans Von Hemert’s name appears as producer on many choice Dutch Glam era singles including Dump’s incredible Annabelle (or Annabella). He also had quite a few releases under his own name and was pretty popular at the time. Musically Because Of The Cats is nailed down by a thumping beat, sports a catchy tune with subtle orchestration and features some choice use of phasing half the way through. A very cool single indeed! The ongoing Brian Engel/ Martin Briley saga continues…Yes, it’s ye old Mandrake Paddle Steamer, Prowler, Liverpool Echo, Shambles guys with the follow up to Do You Like Boys. It’s pretty different from the previous Starbuck release as it leaves the camp element behind, but the 2 sides are veritable corkers. 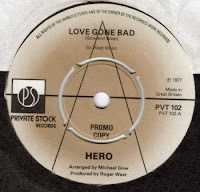 Both songs were written by Howard/Blaikley with Heart Throb being a glammed up 50s / 60s recreation with an incredible production –progressive Doo-Wop anyone? Ricochet is more like Chicory Tip updating The Merseybeat sound but with more oomph. Fantastic stuff! Spent the day checking out the record scene, and I've had a pretty productive day. Many of the shops I had on my list are now closed, but the remaining stores well made up for it so far. The first shops I visited were Zardoz, Slam and Rekord in Schulterblatt. I picked up 4-5 singles there, but following a short taxi ride I landed at Plattenrille which you can find at the end of an alley at 29 Grindelhof. The shop itself is pretty big with an OK collection of singles and a huge amount of LPs, but after talking to Paul who's been running the shop for donkey years, I was invited into the backroom which is in fact more like a warehouse! There must have been over 50.000 singles there, all meticulously alphabetisized. The only shop I know where Cardinal Point have their own section for chrissake! Needless to say, after a good 4 hours going through the boxes, I found 50 singles of note, which come to think of it is the same number I usually find at the Utrecht fair in 2 days! K.K Black -California Sun (produced by Robert Johnson, the guy looks very familiar to me, who is he? The Sorrows -C'Mon Everybody. This looks like the same Sorrows. Not sure if Whitcher/ Lomas are involved, but it's produced by Eddie Seago and John Rossall and it's from 1977!!!! Paul is a very cool guy who knows his stuff inside out. They don't list their stock on the website, but I left quite a few singles, so if you need 10 Elton Motello singles or that elusive Cardinal Point track, you know where to go. They do mail order. 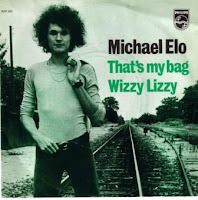 Frizzy Micky sings Wizzy Lizzy! Michael was a Danish citizen who had quite a few releases including a solo album with the self-effacing title "Me" in ‘71. This single was recorded in The Netherlands under the supervision of producer Hans Van Hemert (Because The Cats coming soon…) and it’s a nifty Hard Rockin’ Glam crossover. The lyrics allude to that great Danish obsession with broomsticks and the like, but there’s no foul, only fair to be found here…Perhaps not a great Dane, but a man of definite merit based on this B side in any case. Anyone for Downer Glam syndrome? Go on pop a couple of ‘ludes and get into this baby. I’m not one for growers as life's too short, but this is really something special. It’s pretty indescribable, but I somehow think of Cheap Trick in Dream Police/Voices mode, but persevering with their Lennon obsession with a handful of horse tranquilizers and cheap synths. It sounds like they were even going for a Reggae type beat, but thank god they completely failed in that department. The arrangement and structure are really strange to say the least, just you wait until that thumping middle eight kicks in. Anyhow, this is quite an incredible production, just give it a chance to seep into your (un)consciousness. Thanks for the turn on Bob! I'm off to Hamburg for a few days. Can anyone recommend any record shops? Most listings on the web are done by "dance" music types, but what I want are places where I can find my dodgy 70s singles! 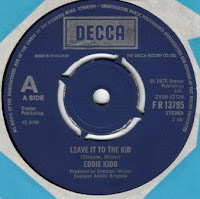 Leave It To The Kid is a bone-crunching-13-double-decker-hopping-semi -smash-stomper by the UK’s own Evel Knievel: Eddie Kidd. Of the Decca singles I have, this is by far the greatest as it’s a truly rousing performance featuring Eddie’s unmistakable vocal range along with a great driving string section. 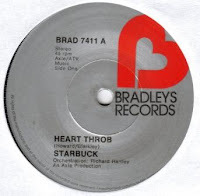 The track was even a "Tony Blackburn Record of the Week", and that man certainly knew his stuff! Eddie retired from stunts a while ago, but I am proud to acknowledge his legendary status here and now, if only for this amazing release. Every time I come back from the fair, the same clichés come to mind:...The sheer size of it is just plain nuts (500+ dealers) and it really pisses all over what passes for major "International" fairs here in London. The aches and pains of crouching, stretching and walking up and down the isles in a crazed daze looking through the Zillions of singles, in the hope of finding that special classic that makes the trip worthwhile, is madness...BUT yes, I found some great and sometimes surprising stuff, but also some hilarious disasters! 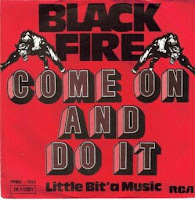 Black Fire -Come On And Do It (RCA Ger 1975). This is in fact the Dutch Black Fire, they renamed the song and gave the new sleeve a certain Pantherman feel to it. Click on the link above to go to the original review and soundclip. The Boer Four -The Boers Have Got My Daddy on Surf City Recordings!!!???? Zips -You're So Good To Me (Yum Yum). This is in fact Pip Whitcher and Roger Lomas (The Sorrows, The Eggy, Renegade). As Zips, they also released Bye Bye Love (with a great B side) on RAK in the UK, but I didn't know about this one, which comes in a gear German pic sleeve. Musically, it's a stange mix of Adrian Baker Beach Boys fixation and Lomas/ Whitcher Heavyness with Glam seasonings. I'll try and report back on Sunday...I will also be spinning a few singles here http://www.dbstudio.nl/ on Friday night, sleep...? Sleep is for wimps! 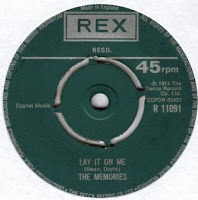 This is definitely one of the more obscure Junkshop Glam singles…It has all the staple trappings including HEYs, handclaps, a mean Glitter fuzz part and it’s from the right year, but… it doesn’t quite make it to upper echelons of Crunching Glam Corkers, and is in a similar bag as Loco's At The Local Dance (BASF). 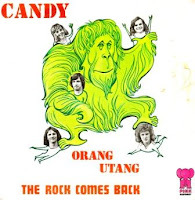 Still the cartoon voice intro and the Glam-by-numbers arrangement, make this single a nice find and not only because it’s so damn obscure…The B side is also a rocker but in a lighter quasi-Bubblegum mode…Were they perhaps an Irish band?? ?